By Singyin Lee in Social Media. Updated on November 13, 2017 . I’m sure you’ve heard of Facebook. It doesn’t matter if you are on it or not, active or not, or hate it or not; if you are on the Internet, you know what Facebook is. Safe to say that after nearly a decade, Facebook is still going strong and affecting the lives of millions every day. And if you have been on it for years, you would have known about some of the things Facebook users do that just makes no sense. But I guess this is just the new wave coming (or is it here already?). It’s quite common to see Facebookers post photos of their meals, self-portraits of them sleeping (don’t ask me why) or secret tips about how to stay healthy without exercising (hm…). If you find this silly, remember back to the time when we were sending chain mails because we don’t want to die in 7 days. Here are 20 other things Facebookers should know by now (but still has to be said). … and it is going to stay that way. To be fair, you don’t have to pay with money to stay on Facebook. You may however need to pay with other things, like your data, or being subjected to ads, products and messages from advertisers. Do sick babies need your ‘Likes’ and ‘Shares’ to get Facebook to donate money to them? Nope. What they need is treatment for their illness, and for people to respect their privacy and not take advantage of their photos. Your clicks do help make money, for the pages that are sharing these messages. ‘Likes’ increase the fan base, ‘Shares’ give them exposure. Everything makes sense now, doesn’t it? If the family of sick babies are not getting any money, why do you think you are getting some just for sharing? 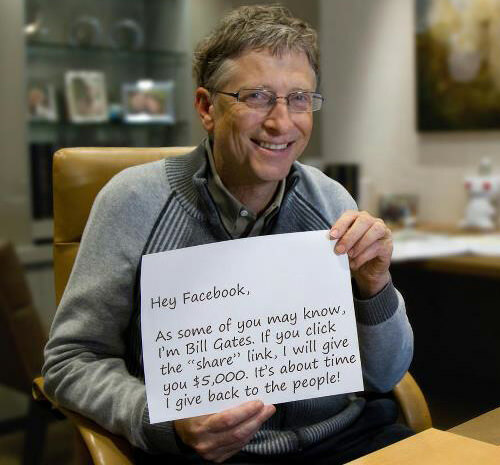 Even if Bill Gates holds up a (Photoshopped) sign saying you get 5 grand for clicking ‘Share’. Seriously, people. You know about the think before you print move right? Maybe we should start a ‘Think Before You Share’ movement. Game invites and requests are a major source of relationship breakdowns. If you play Facebook games, please try to not send help requests indiscriminately. It’s for your own good. Not everything you read on Facebook is true. If any particular food is inducing cancer in people, reports would have been filed and it would have been taken off shelves. 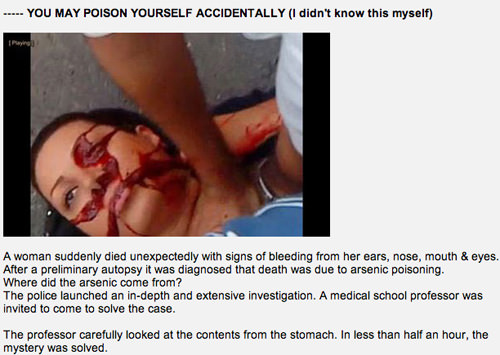 It takes two minutes to copy and paste the gist of the message into Google and to check if it is a hoax or not. Two minutes. Otherwise, check the image. Problem is, the photo that was attached to the warning was actually a photo of a brave protester who was shot and killed in a protest in Iran, 2009. Google Image will probably help in that area. And if you are still wondering if this arsenic poisoning story is true or not, you better stop using lemon on your sea bass. Tagging a friend’s name into one of your shared photos will give their friends access to your photo. Translation: every friend you tag into your photos have friends that you do not know. And whatever drunken, funny, ridiculous or humiliating photo you tag your friends in, shows up on their friends’ feed as well. Facebook has always been the cure for a narcissistic rant. If you want people to like you, don’t voice your opinions on religious, political or sensitive issues. If you can’t help it, it’s fine, just don’t expect people to like your statuses as much as you do. And the world is at peace again. 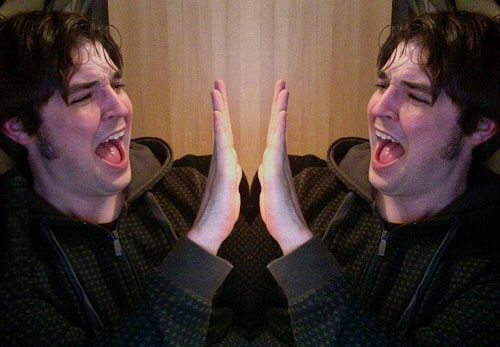 It is kind of like giving yourself a high five, at times it’s like you are comforting yourself for coming in last in a marathon. It’s part congratulatory, part consoling, and you know it is bad when your own Like is the only one registered there. You posted it, so don’t you think that counts as a Like already? If Timmy and Tommy block each other, Facebook automatically breaks them up. With a two-way block, you both get pushed back to the ‘Send friend request’ stage. This is a super awkward conversation piece in parties and get-togethers. See #11 for a solution. Did you know that you can keep someone out of your feed but still keep them as friends? If some of your friends tire you out with never-ending repeats of things you do not want to see, just opt out of seeing them in your news feed. Check this post on how you can better manage your Facebook Wall Feeds. Note however that they can still see your feed. 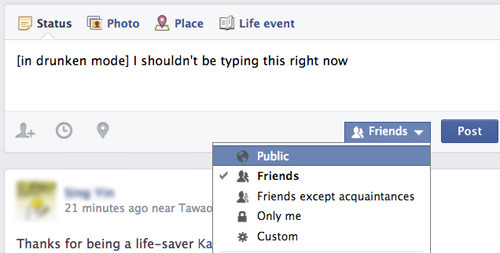 There is the option to set whatever you share to turn up only in your Friends’ feed or publicly. If you open your Facebook to subscription and hence have followers, this is your way to keep your personal feeds to just your friend’s views and other stuff for public scrutiny. I love Ellen, and the crazy things she does on her show, particular one that outs people for the humiliating things they do on Facebook on nationwide TV. Yeah, if it’s Not Safe For Mom, don’t put it up on your Facebook because once it is out there, it’s out there. Ellen will make sure of it (and give you an iPad so you won’t sue her). Yes, Facebook has lousy privacy settings but unless you are in the witness protection program or put someone in there, privacy should be the least of your worries. If it still is, that would mean that you are posting something up there that you don’t want some people to know. Choose to share it and expect it to end up somewhere you may not like or don’t post it, and take the secret to your grave. See, you do have a choice. Sharing is caring, unless it has to do with your Facebook. When viewing your Facebook account on someone else’s device, remember that the Log Out button is your friend. Avoid being the victim of a friendly ‘hack’ or worse, losing your account and everything attached to it to an actual hacker. If you run a page, don’t treat it like a personal profile. Having a bad attitude or lousy PR skills negates your role as a social profile manager. Don’t bash your customers even if they are trolls, even if they are ‘asking for it’. It’s never worth it. Facebook is one of the most powerful (if not the most) news-spreading tool on the Internet right now. Whatever it is that you share, you direct traffic to. If you come across a video that is showing cruelty to animals which makes you angry, the last thing you want to do is sharing the video and saying your thoughts about it. Why? Because you are helping the video gain exposure; you are helping to spread the video. There is no such thing as bad publicity on the Internet or on Facebook. Wherever you drive traffic to, the receiver will thank you for it. It’s hard to find friends from other countries, cultures or backgrounds if you keep insisting that they speak your language. If you want to mingle, let your friends use whichever language they want, while you use Google Translate or the ‘See translation’ link you see below statuses made in foreign languages. Suffered an injustice in the hands of a bad waiter, a roach in your salad, a faulty product or a rude sales rep? Don’t take it to your own facebook wall to complain about them; take it up with their social media page. You can send them a private message or post it on their Wall but try to be civil about it (hard as it may seems). If you want to release frustration, remember that the person in charge of the wall will probably be a different person than the one who made you angry. Sought for a solution rather than retribution. Drop in your two cents. I know you have plenty. Floor’s yours.